Focused ion beam (FIB) milling is a widely used technique for today’s cutting-edge materials that provides a means to prepare transmission electron microscopy (TEM) specimens. The challenge in working with these advanced materials is to create specimens that are electron transparent and are free from artifacts. The FIB is highly effective in preparing TEM specimens, but the use of a high-energy, liquid metal ion source can often result in specimen amorphization, gallium implantation, or both. The PicoMill system is the ideal complement to FIB technology; it adds the increased capability of producing optimal specimen quality while enhancing the overall specimen preparation throughput by moving final thinning offline. To maximize FIB capacity, specimens can be moved offline for final thinning on the PicoMill system. The PicoMill system provides the ability to precisely and predictably thin a specimen, which reduces the potential for rework and optimizes specimen processing time. This increases your capability by producing specimens of superior quality and enhances the overall specimen preparation throughput. 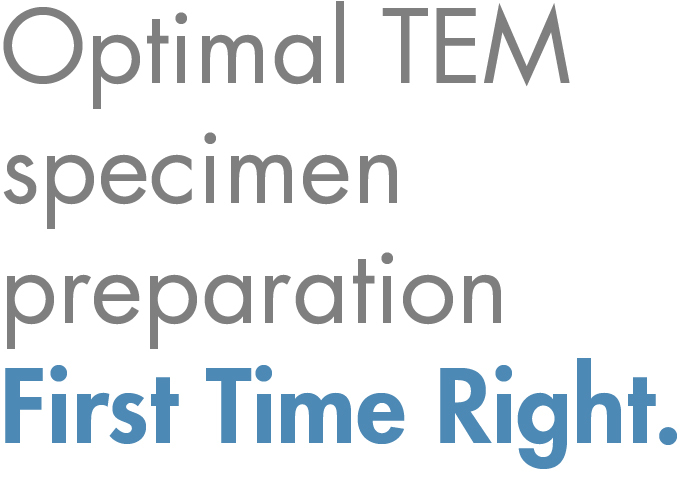 The PicoMill system will allow you to achieve first time right specimen preparation every time. The PicoMill system’s ion source features a filament-based ionization chamber and electrostatic lenses. The ion source was specifically developed to produce ultra-low ion energies with a submicron ion beam diameter. It uses inert gas (argon) and has an operating voltage range of 50 eV to 2 kV. The ion source’s feedback control algorithm automatically produces stable and repeatable ion beam conditions over a wide variety of milling parameters. Redeposition of sputtered material onto the area of interest is avoided because the ion beam can be focused to a specific area. You can scan a region of the specimen’s surface or target a specific area for selective milling. The ions only contact the site of interest on the specimen where they are needed to do the work. The ion beam is kept away from the grid, which prevents redeposition. The ion beam impingement angle is programmable from -15° to +90°. The ion source is fixed in position and the goniometer tilts the specimen holder to achieve the programmed milling angle through the PicoMill system user interface. The specimen is positioned along the X, Y, and Z axes to precisely orient the FIB lamella with respect to the ion and electron beams. Milling specimens at a low angle of incidence (fewer than 10°) minimizes damage and specimen heating. Because low-angle milling, combined with ion beam rasterizing, facilitates uniform thinning of dissimilar materials, it is highly beneficial when preparing layered structures or composite materials. The detector combination allows you to perform in situ imaging of the specimen before, during, and after ion milling. The grid containing a FIB lamella or a specific site on a conventionally prepared specimen can be imaged. You can view specimens in situ on a dedicated monitor that displays both electron- and ion-induced secondary electron images. Image capture is as simple as a click of a mouse. A specimen prepared with optimal electron transparency is the ultimate goal for the best quality TEM imaging and analysis. This is particularly key when employing today’s aberration-corrected TEM technology. As the specimen thins, electron transmission increases and the leading edge recedes, which allows the STEM detector to provide end point information. The PicoMill system is also capable of time-based termination or it can be stopped manually. The ability to use the same holder in the PicoMill system and the TEM means that you can quickly and safely transport the milled specimen from the PicoMill system to the TEM, which is particularly advantageous when you are working with one-of-a-kind specimens. PicoMill is a registered trademark of E.A. Fischione Instruments, Inc. PicoMilling is a service mark of E.A. Fischione Instruments, Inc.